Keyword research is essential to a successful SEO campaign and for optimizing content strategy. This post will serve as an in depth guide to use when it comes time to perform keyword research to find the most optimal keywords for an SEO strategy. Also, this guide will help for planning a content creation strategy around the keywords that are identified during the research phase. Wham bam, a two step guide to getting a website ranking at the top. And don’t forget to checkout all of our free SEO guides. 1. Have high search volume. You need to be sure that people are actively searching for your keywords that are relevant to your site. It is also important to find keywords that have relatively low competition. This will make ranking for these particular keywords easier and improve your chances of generating more traffic via search engines, as a result. 3. Are supported by your content. You need to be sure that the keywords you choose to try to rank for are actually relevant to the content that is on your website. It would do no good to rank for irrelevant keywords. There are plenty of tools that you can use to aid in finding the best keywords for your website. The most popular tool to use is created by the largest search engine itself – Google’s search based keyword AdWord tool. This tool provides results based on actual searches completed on Google. 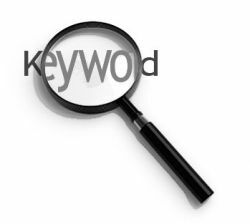 Therefore, it is easily one of the most effective and usable keyword search tools on the market. If you utilize it while logged into your AdWord’s account, it will give you a customized list of keywords that are targeted specifically for the website linked to the account. This phrase was coined by Chris Anderson. It describes the theory that many low traffic keywords can collectively generate more visitors faster than a couple of high traffic keywords that can be harder to rank for. Amazon may get thousands and thousands of visits from the keyword “DVD.” However, they get millions of visits from all of the individual DVD titles that exist on their marketplace. When you look at them individually, none of them come close to the amount of traffic as the keyword “DVD,” but when you combine all of the individual “long tail keywords,” their volume is even larger than the single “popular” keyword. How does/should Long Tail Keywords apply to you? When you look at the facts, all of your long tail keywords should make up over 80 percent of your traffic. Therefore, when you are researching keywords for your website, it would be wise to not just focus on the ones that are receiving tons of traffic and hits. Rather, you should focus on the less popular and easier to rank for keywords. You should incorporate these keywords into your overall ranking strategy. That way, you will be able to rank easier and faster. Once you pick the right keywords to target, it is very important to start creating your content to incorporate them. Search engines have automatic bots that run through your website to decide whether or not it is relevant. You can influence these bots rankings by strategically optimizing your content to include certain long tail keywords. This is especially true when you are creating content that bots cannot yet read. Bots are currently able to interpret text. However, they are not yet able to decipher videos, images, or audio files. Therefore, you are going to need to describe these types of content with text. That way, your content will be easily understood by Google’s bots. It is important to write for a real audience. Writing strictly for search engines will make your content boring to read, and this will detract from the amount of visitors that “stick” to your website. Your mission is to convert your visitors into active readers and/or buyers. Therefore, you need to optimize your site/content without detracting from the quality of your website. For advice on keyword usage and placement, checkout this quick keyword placement guide for on page SEO. Keller founded Volume SEO and Volume Designs in 2013, an Austin SEO company and an Austin Web Design company. When he isn’t building websites or driving traffic to them he enjoys tennis, running, and hanging out with friends and family.